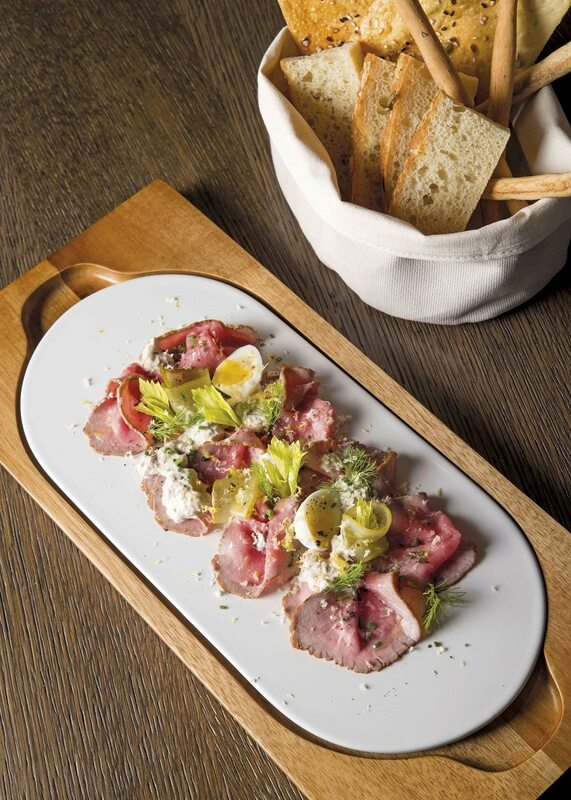 Judging from the recent spate of restaurant openings, ’tis the season of the celebrity chef. And arguably among the most highly anticipated is Bread Street Kitchen, which is helmed by Michelin-starred chef Gordon Ramsay. After all, the straight-talking Briton is a household name here, thanks to his 2013 cook-off against Singapore hawkers and his hosting gigs on television programmes such as MasterChef and Hell’s Kitchen (which have given audiences a deeper appreciation of his cooking finesse and well, colourful vocabulary). So, naturally, when news broke last year that he was launching his first Singapore outpost, it sparked excitement among local gourmands. Location and design-wise, the establishment gets everything right. Designed by Blueplate Studios, a subsidiary of architecture firm Wilson Associates (which was also behind David Myers’ Adrift restaurant), it exudes laidback appeal with its industrial-chic wooden tables and wire mesh furnishings. Spread out over two storeys at Marina Bay Sands, it also boasts a splendid view of the waterfront. The upper level is bright and spacious, thanks to an abundance of natural light, while the lower level, which also houses a 14-seater private room, has a more intimate setting, making it ideal for dinner dates and group get-togethers alike. With its well-conceptualised interior and its glitzy celebrity tag, it may come as a surprise that the restaurant’s British-European cuisine borders on the ordinary with everyday favourites such as veal carpaccio, fish and chips, and a few Asian-inspired creations (such as California maki roll, which he fills with blue swimmer crab meat instead of the ubiquitous crabstick) on the menu. Fancy, it may not be, but it is a solid repertoire of comfort food. Take, for instance, the macaroni cheese, which one may be tempted to pass on, given just how pedestrian the dish has become in the eyes of the well-travelled foodie. But the dish turns out to be a delightfully gooey concoction stacked with gruyere, mozzarella and parmesan cheese, and dusted with aromatic garlic-roasted bread crumbs. Another surprising winner is the unassuming Shepherd’s Pie, with fluffy potato packed with succulent chunks of lamb. According to Executive Chef Sabrina Stillhart, the meat is first seasoned with salt and pepper, seared and then braised in veal and chicken stock for two to three hours to remove its gamey scent. Though these dishes ooze home-made goodness, the restaurant misses the mark with some of its much-raved-about house specials. One example is the pork belly, which is slow-roasted in an oven for two-and-a-half hours till its skin becomes a layer of golden crackling. The free-range meat — sourced from a farm in the UK — is tender but its leathery skin disappoints. It also lacks that wow factor to set it apart from humbler establishments’ renditions of sio bak (roasted pork). The spiced tuna tartare also fails to impress, as the yellowfin tuna’s natural sweetness is overpowered by a heady marinade of chili sauce and sesame oil. The saving grace for this dish is the side serving of crispy wonton skin, which adds a textural contrast to the softness of the raw fish. Skip these and have the fish and chips instead: Beer-battered to perfection, the New Zealand Hoki fish fillet comes with satisfyingly chunky fries and crushed peas. Another must-try is the tamarind spiced wings, which are first marinated in an assortment of spices including ground turmeric, chili powder, cumin and garam masala, before being coated in rice flour and deep-fried. Topped with fragrant spring onions and coriander, it is a delectable mix of sweet and tangy flavours. The desserts are a mixed bag. One standout is the Monkey Shoulder cranachan cheesecake, a creamy no-bake confection with a dash of Scotch whisky that packs a punch. Less intriguing are the humdrum chocolate fondant (which would have gone better with vanilla instead of mint ice cream) and pineapple carpaccio with coconut sorbet, which works as a palate cleanser but doesn’t leave much of an impression. So, does Bread Street Kitchen live up to its hype? The answer depends on one’s expectations. It is not the place for gourmet fare, but it does hit the spot if you’re hankering for hearty, down-to-earth British grub. That said, there’s still room for fine-tuning and the restaurant needs to up its game to be fully deserving of its celebrity association.